This topic was published by DevynCJohnson and viewed 1163 times since " July 28, 2015 @ 06:00UTC ". The last page revision was " October 10, 2015 @ 17:30EDT ". The Filesystem in Userspace (FUSE) is a special part of the Linux kernel that allows regular users to make and use their own filesystems without needing to change the kernel or have Root privileges. The filesystems used in FUSE are virtual filesystems. Not all virtual filesystems use FUSE. The code for FUSE itself is in the kernel, but the filesystem is in userspace. However, typical filesystems exist in the kernelspace. FUSE allows users to make their own filesystems, modify filesystems, or use a special filesystem temporarily. FUSE can also be used to add extra features and abilities to a system or software. For example, GVFS (GNOME Virtual FileSystem) is a filesystem that allows applications to access remote files as if they were local. FUSE makes this possible. Also, at the time this article was written, the Linux kernel did not natively support exFAT (also called FAT64). If users wish to access a storage unit with a exFAT/FAT64 filesystem, users can mount the filesystem in FUSE. However, FUSE may need some extra packages to be installed to run some filesystems or virtual filesystems. For instance, if a user wanted to use exFAT like in the example above, then the user would need to install the "exfat-fuse" package which extends FUSE's abilities. The "exfat-fuse" package is a FUSE driver. 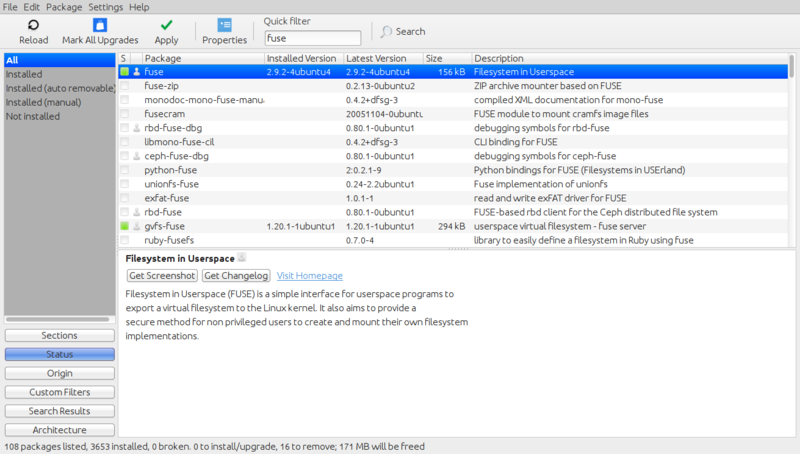 Many drivers/extensions are available for FUSE. FUSE is hosted at http://fuse.sourceforge.net/. FUSE is open-source freeware that anyone may obtain and use. FUSE is stable, secure, and reliable. However, it is more efficient to use a "real" filesystem if possible. FUSE is compatible and works on Solaris, FreeBSD, Darwin, GNU/Hurd, OS X, Opensolaris, and others. Some operating systems do not support FUSE. Such systems can use a fork of FUSE or use an alternative. For example, NetBSD uses PUFFS and Windows uses "fuse4win". FUSE not only mounts virtual filesystems, but also "real" filesystems like ZFS and exFAT. FUSE can also mount files like ISOs, CD track files, and compressed files (zip, gzip, tar, etc.). FUSE's abilities extend to network filesystems like HTTP-FS, aptfs (apt repos), and others. FUSE can also be used to transfer files to Apple devices like the ipod and iphone (iFUSE). Amazingly, FUSE can also be used to convert FLAC to MP3 via the MP3 filesystem (mp3fs). Users can program their own filesystems and use them in FUSE without changing the Linux kernel or needing Root privileges. Users program filesystems in a similar way programs are coded. If users wished to program a virtual filesystem using Ruby, then the programmer would need the "ruby-fusefs" package. FUSE bindings exist for many programming languages including Perl, Python, C/C++. C#, and many others. The complete list of language bindings are here (http://sourceforge.net/apps/mediawiki/fuse/index.php?title=LanguageBindings). With FUSE, these virtual filesystems are not formatted. Rather, all a user needs to do to initiate a FUSE filesystem is to mount the specified FUSE filesystem to an empty directory that a user has permissions to use. Now that many of you know a lot about FUSE, it is time to explain how it works. FUSE is a Linux module that acts as a "middle-man" or mediator between the FUSE filesystem and the Linux-kernel's VFS module. The VFS module can only be accessed by privileged users or processes. Since all users may access FUSE and FUSE may access VFS, that is how the permissions work to allow any user to use a FUSE filesystem. As for the FUSE filesystem itself, the code contains a structure variable that contains a pointer to functions in the FUSE filesystem code that respond to various actions that a process may try to use. In simple terms, the structure variable is a set of code that says a "read" syscall must have a particular set of parameters and is handled by a specific function defined in the FUSE filesystem's code. So, if a process using a FUSE filesystem performs some task that uses the write() syscall, then the filesystem code will execute the code for write(). When you write code for a FUSE filesystem, you could program it that when a process writes to a file that a copy of the file is to be made first. Import Headers – all C/C++ code imports headers and other programming language import some kind of library. Declare Variables – Any variables that are used a lot in the code should be declared near the topic of the source code so the programmers can easily find and change global variables. Syscall Declaration – A variable structure titled "fuse_operations" declares a syscall and needed parameters. Syscall Functions – Next, programmers would write code for the action or actions that should occur when a particular syscall is declared. Developers may have a function for open(), write(), read(), and many other syscalls or needed features. Main() - Obviously, if the FUSE filesystem is coded in C/C++, you will have a "int main()" which is where the code "starts" after the functions and variables are set. When the filesystem "executes", FUSE will be a mediator and communicate with the kernel on behalf of the FUSE filesystem. Below is sample FUSE filesystem code that came from FUSE's Sourceforge page (http://fuse.sourceforge.net/helloworld.html).